Stimulate the proven power of your "inner" mind to make effort-free changes deep within that affects outer actions for lasting weight loss. Life is busy enough. You can hire a health coach, a personal trainer, and a hypnotherapist to help you stay fit and reach your ideal weight. Yet in only 30 minutes a day for six days in a row, you will see how much better life can be. Your first session begins the moment you close your eyes, relax from the comfort of your own home, and just breathe. 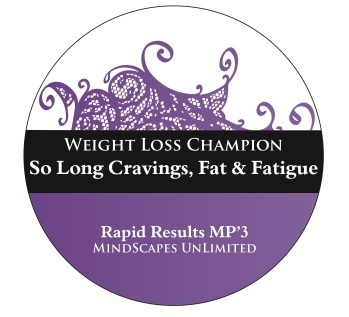 "I listen to the Weight Loss Champion Hypnosis Audio every morning. All can say is: AMAZING!!!!! Wow, I am just ready to start my Day with a LEAP and FULL of FEEL GOOD THOUGHTS, and FEEL GOOD CHOICES! Thank You very much Lori for creating this audio. This is PLATINUM to me. AND when I'm drained around 3:00 and listen to the audio II feel rejuvenated, and have so much more energy that carries me through the rest of the afternoon and evening. I used to feel tired and less-focused after 2:00 p.m. and drank coffee, energy drinks, and ate sugar laiden foods. From the first day I listened to Weight Loss Champion, my cravings subsided and I noticed instant rejuvenation..."
Offer Weigth Loss Champion to Your Clients and Enhance YOUR results! Contact us for a Special Pricing Code.